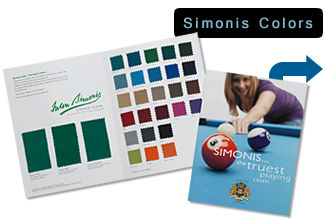 Simonis Cloth provides superior accuracy and consistency for your game and you should not settle for less on your table. It is the perfect choice for commercial or home application. Simonis cloth is very different from the fuzzy and cheap "felt" that is still used in the industry. Simonis cloth is a woven fabric and is precisely sheared to avoid affecting the roll of the balls. You can readily see the weave of our cloth. Simonis recommends installation by professionally trained table mechanics only. Have you heard the myth that Simonis cloth is difficult to install? Q. Simonis cloth is harder to stretch than other cloths. A. This is true and it is intentional. Simonis goes to great lengths to ensure that our cloth stays within small, specified ranges of extension and elasticity. The benefit of this precision tolerancing is that, once the cloth is properly installed, it will not loosen or require re-stretching like many lesser quality cloths. In addition, any small damage to the playfield will not grow or spread as it does in lesser quality cloths. Did you know that proper installation of your cloth can prevent premature wear? If cloth is installed too loosely, the cloth can "bunch up" in front of the ball, thus greatly increasing the appearance of marks on the cloth. Cloth that continues to stretch or "relax" after installation will also suffer from this problem. Simonis cloth is meant to be installed tightly over the surface of the slate, and our careful attention in the manufacturing process means that the cloth will not loosen once properly installed. This not only provides the best playing conditions, but it will ultimately increase the usable life of your cloth and your enjoyment of the game. Refer to the Simonis installation training videos for proper installation. As always, be sure to keep the balls and the playfield clean. Simonis cloth can be glued, but only with certain adhesives. Most spray adhesives, WILL NOT hold the cloth in a edge-glue application. We recommend 3M Fast-Bond10™ for edge-glue glue-down installations. Currently, we are not aware of any other adhesives that will give proper adhesion for a straight edge-glue install. Many tables require special sizes in order to be covered properly. The Simonis Standard Guide is provided for general reference.